Do you recognize this vestment/stole? I am researching the history of a stole I found in a box of early 1900’s antiques at an auction house. I have been trying to find out what organization may have worn it? A priest? Group leader? And about what time period it really may be from. I have no idea where to go from here – can you shed some light or give me a educated guess? I have attached one picture, the two medallions are plastic but have In Hoc Signo Vinces on both of them. I can send more if you're interested. 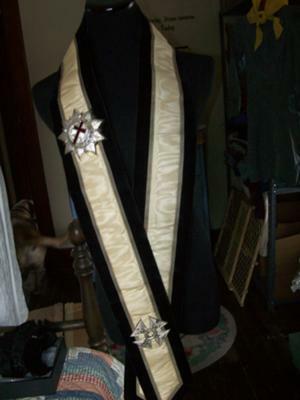 Comments for Do you recognize this vestment/stole? My mother, Lynne Green, said she didn't think they had plastic until after World War II, so if the medallion was plastic, it couldn't be from the early 1900's. 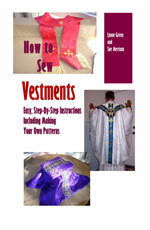 Plus, plastic has never been used with vestments, and if it is a vestment stole, it was made just recently. As for me, Sue Merriam, the medallion vaguely reminds me of the insignia I used to see on the Oddfellows Lodge (the building was next to where my husband used to work), but I am not sure. You can see what some of the Oddfellows jewelry looked like by clicking here. Although we could be wrong, we doubt very seriously that it is a vestment stole.